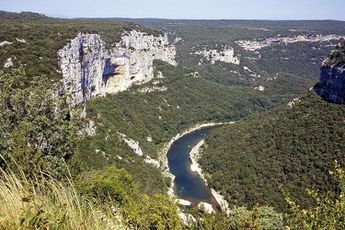 At the heart of one of the most beautiful regions in France, in an environment where nature is preserved, le Petit Bois welcomes you to Ruoms, in Ardèche. 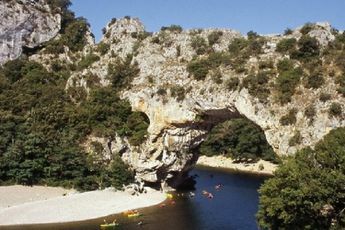 Between river and tourist attractions, this family campsite situated at the gates to the Gorges de l'Ardèche (the Ardèche Gorges) is perfect to relax. Ode to healing, place of relaxation and village of charm are all ways to describe this unspoilt campsite. You can find many modern facilities here like the pool area (with indoor pool, spa, water-slide, paddling pool) wher you can partake in exhilarating water-sports. Take the time to rest on the restaurant terrace sipping a glass or enjoying the food. Le Petit Bois offers lively entertainment at the kids' club. A stone's throw from sites of natural beauty, like the river, le Petit Bois is perfect for hiking, walking, canoe tours and other thrilling activities. Use your stay to discover the wonders of Ruoms, its round towers, its Romanesque church, its night market, its tourist Route des Défilés and its other attractions. Surrounded by four rivers with crystal waters, this region is the ideal area for canoe and kayak enthusiasts, but also for hikers.